Chris and I have been a bit preoccupied over the last 6 weeks or so. It started innocently enough, with a broken down keg fridge. Actually, if you go that far back, the whole thing started in late July, when we declared the fridge truly dead. The story of the keg fridge and its replacement is a saga of its own, but suffice it to say a post will come eventually, when that story is completed. Right now, a modified chest freezer is doing the beer-chilling job (more to come, trust me). But said freezer needed a home, and this led to the removal of an old corner cabinet from the kitchen, which in turn left an ugly turquoise, cabinet-shaped shadow on our kitchen walls. Eventually we decided that we would paint. This decision wasn’t easy; every bit of renovation work we undertake in this house leads only to our own increased comfort/livability. These improvements don’t add a cent to the value to our home, as our wee bungalow would only be demolished to make way for a McMansion if we sold it. We’re considering the possibility of a rebuild at some point ourselves (not a McMansion!) but for now, that’s at least a few years off. So… hours and hours of patching cracks and many coats of paint later, we have a bright new livable kitchen again that looks world’s better than before. Sure, the cabinets are old (don’t look inside), and the counter tops are beaten, chipped and worn; there’s at least four layers of floor (one of them carpet — yes, CARPET) topped with an ancient layer of linoleum; but the look is unified, the turquoise is all gone, the walls are smooth, the hideous light pink paint is gone, and the raw trim around the windows is finally white. 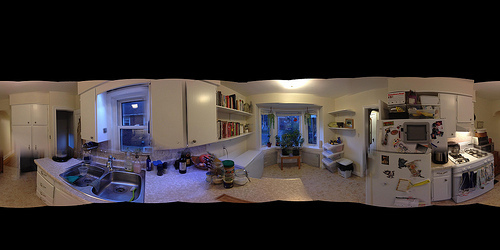 The panorama above works much better if you look at it using Occipital’s interactive 3D viewer. Created using the 360 Panorama App for iPhone. View the “before”. 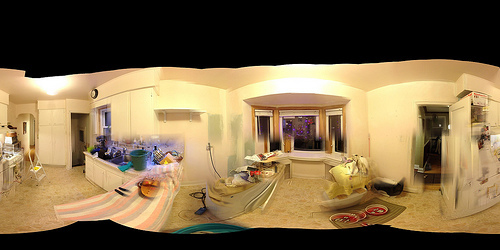 View the “after” in the interactive 3D viewer. I haven’t taken the money shots with the good camera yet because we still need to finish some bits, like new switch plates, some quarter-round on the floor and some trim around the rads. I’m still figuring out what I want to display on all my hugely increased shelf space, but that won’t take me long! The new paint makes a world of difference. I can’t believe we didn’t do this sooner (or rather, I can — it was a hell of a lot of work). I wish we had. But you know, you get used to the ugly and tell yourself eventually, eventually. Considering this room is where I enjoy spending most of my time, it was long over due for a freshening up. What a difference! Wow, I love the shelving! possibilities abound!